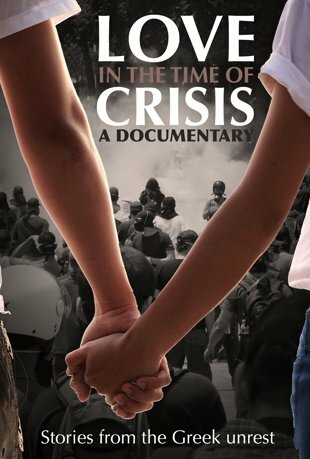 Here’s a short video on the current situation in Greece, produced by Ross Domoney. I found it interesting and informative and thought you will too. On September 18th a self-confessed GD member, Giorgos Roupakias, stabbed anti-fascist rap musician Pavlos Fyssas (aka Killah-P) to death. In the aftermath of the assassination the GD leader, Nikos Mihaloliakos, and key GD MPs and members have been arrested and charged. Only now, after decades of presence in the Greek political landscape, the GD’s connections to the country’s security forces and political establishment are untangled and exposed in mainstream political discourse and in the media. 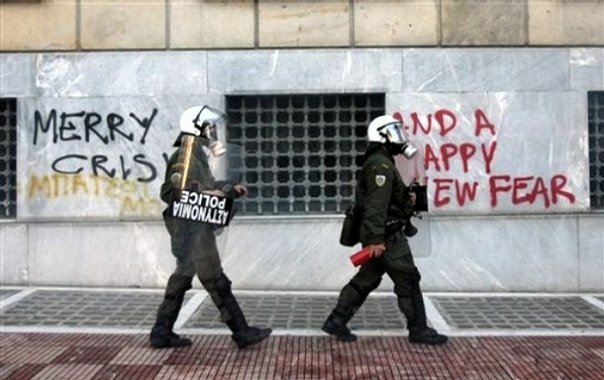 Some photos to “celebrate” the day… This is Christmas 2011 in Greece. 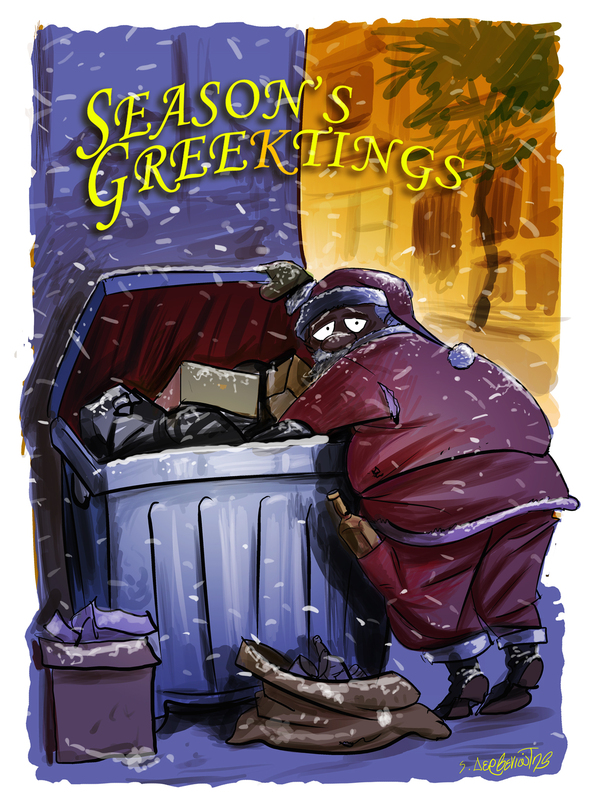 Season’s Greektings by Greek illustrator Spyros Derveniotis. Daniel, a British Erasmus student in Athens, sent me this photo – it’s a motto that has been around since the 2008 killing of Alexis Grigoropoulos by a policeman, an assassination that caused a rioting chaos in Athens for more than a month. Daniel took this photo in Panteion University. This is a graffiti on the external wall of Athens University’s old building (now mainly used for graduation ceremonies). I think the graffiti has been taken off by now. If I am not mistaken, this graffiti was on the external wall of the Central Bank of Greece, at Panepistimiou street. Here’s a video from the city-sponsored Christmas tree in Syntagma square, back in 2008. Its burning was an unforgettable view. For almost a decade, the city’s mayors were proud of wasting thousands of euros to build “the tallest christmas tree in Europe”. This shallow megalomania that only needed a spark to show the void spirit of our corrupt politicians. At first, people decorated the tree with garbage bags. Then the tree was set on fire. As you can see, that night, riot police used tear gas to disperse the crowd. It was a very moving view. Finally, here’s a video by Ross Domoney, with a short historical background on the Alexis Grigoropoulos’ assassination and footage from this year’s demo which commemmorated the killing.